In 1911, the chief geologist of the colonial administration in Deutsch-Südwest Afrika, Dr. Paul Range, was advised by the governor to survey the find locations and to purchase all remaining meteorites of the Mukerop area. Range admits this was an “interesting enough order” and so he frequently visited Amalia, Goamus, Kameelhar and other farms in the Gibeon area between 1911 and 1913. In 1913 he published the results of his survey in the article “Meteoriten aus Deutsch Südwest Afrika” in vol. 26 of the colonial periodical “Mitteilungen aus den Deutschen Schutzgebieten”. Before 1911, apart from the four masses already known to Brezina and Cohen, several additional specimens had been exported to Germany via the colonial company Hesselbach. At least three specimens went to the Mineralogical Museum of the Hamburg University. The two smaller specimens were cut into sections and used for trades with various museums worldwide, among them the Smithsonian. The biggest specimen of 420 kg still resides in the Hamburg collection today. 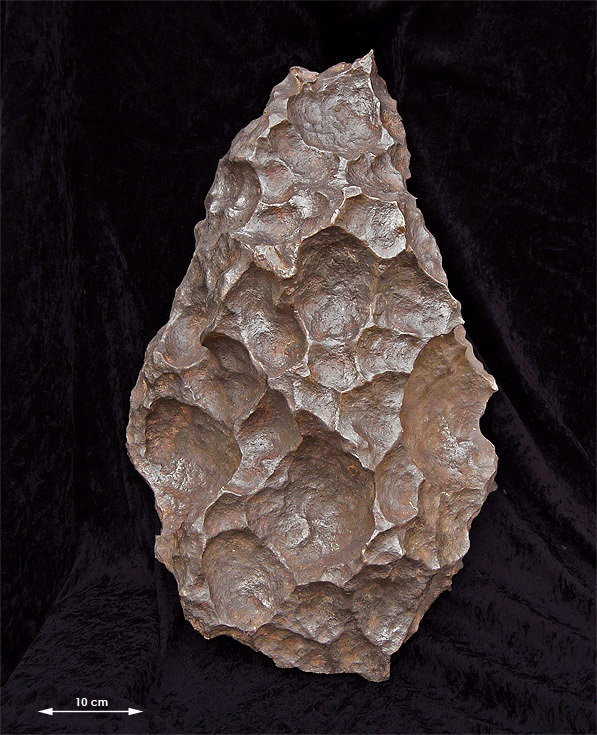 Range stated that the meteorites are usually found with the bulk of the mass embedded in the soil, though some of their finds were recovered from on top of the surface. The soils in the eastern part of the Gibeon district belong to the Karoo and Post-Karoo layers and are covered by the Kalahari lime formations. The meteorites found by Range were recovered partly from Karroo layers and partly from on top of Kalahari limestone plateaus. 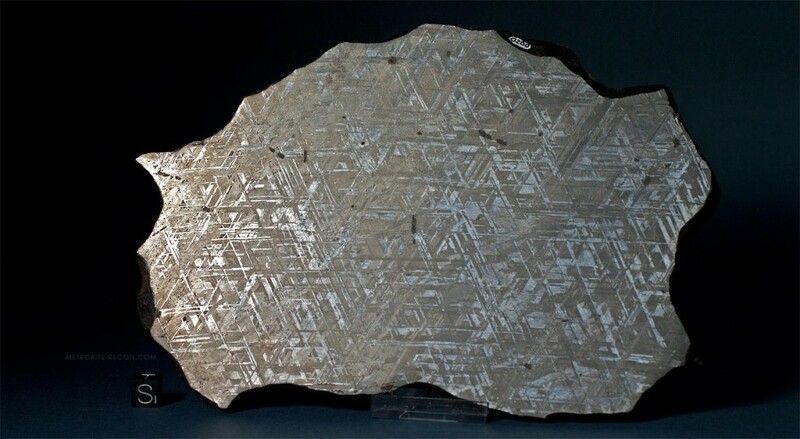 Because the latter formation is considered of diluvial origin Range concluded that the terrestrial age of the meteorites could not exceed these layers. Range’s research from 1911 to 1913 brought to light 51 meteoritic masses including those found before his survey. The total weight of these Meteorites was 15,396 kg. The 37 masses piled up and later caged in in the public garden in Windhoek originate from Range’s field collection. After several donations to foreign museums and prominent collectors, including a 650 kg mass which went to South Africa, 33 masses were left. Of these 28 are on public display today in Post Street Mall in Windhoek. In 1967, Robert Citron undertook an invaluable survey of the distribution of the Gibeon iron meteorites and published the results in his paper On The Distribution Of The Gibeon Meteorites Of South-West Africa. Citron dismissed the idea of a swarm of meteorites travelling together in space and suggested that in fact the Gibeon irons represented a single body that fragmented in mid air during its flight through the atmosphere. 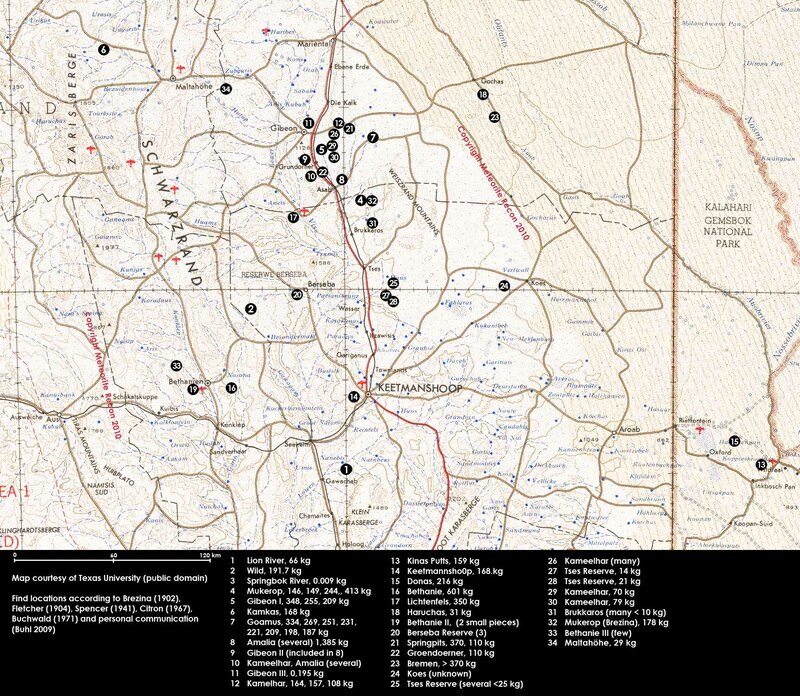 Citron also provided a new distribution map which gave the find positions of many of the 65 finds known at his time. Through his work the extensive dimensions of the strewn field became obvious. Although at least 53 of the 65 known masses were recovered from a 300 square mile area within 20 miles of 25°10’S and 18°00’E centring around the Bukarros structure, the remaining 12 masses were scattered over an extensive area up to 145 miles away from this position. The maximum separation between two meteorites reported to have been found in their original position is 230 miles (Kamkas and Kinas Putts). Buchwald in vol. 2 of his Handbook Of Iron Meteorites gave an extensive survey of the research on Gibeon and provided another map which also included many masses for which no precise find locations were conveyed. Gibeon according to Buchwald is classified as a group IVa polycrystalline fine octahedrite with a Widmannstätten bandwith of 0.30 + 0.05 mm. The Ni content is given with 7.93 wt% and the Co content with 0.41 wt% (Buchwald 1975). As has already been stated by Shepard, some of the Gibeon masses display a remarkably unoxidized surface. By referring to the 650 kg Lichtenfels mass (see photo on the next page) Buchwald noted the occurrence of fusion crust and flow features on several of the specimens he examined. Because many Gibeon cut sections show heat affected zones on their rims, Buchwald argued that only little material was lost to oxidation and erosion.